Winter is on its way, and with that always comes the lovely cold and flu season. Baby’s first cold is heartbreaking. Not only because its torture to watch them be uncomfortable, but also because you probably won’t be getting any sleep. Not a fun combo. There are those who believe in staying home and keeping all germs at bay, and those who want to embrace the building of little one’s immune system. And those who try and find a balance in between. Take into consideration baby’s age – the younger baby is, the more careful you’ll want to be. A cold itself won’t be too big of a deal, but if it turns into pneumonia or croup it can become dangerous. If baby is under 3 months or younger, any sign of illness can warrant a call do the doc, especially if a fever is involved. Better to be safe than sorry. 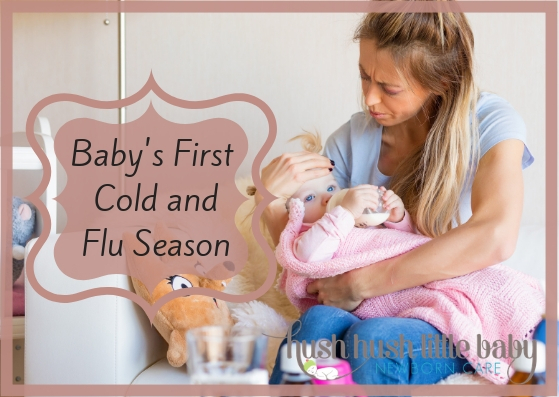 But here are a few tips for surviving baby’s first cold and flu season! It’s just science that the more people who are around, the greater the chance you’ll catch something. Many people avoid crowds and super busy places for baby’s first year of life, just to be safe. Whether you’ll do that is up to you. If baby is in daycare they’ll likely get sick a few times, so you may choose to stay home on the weekends to avoid extra germs. But, chances are that even if you avoid large groups of people, baby will still catch something. It’s inevitable. Just use your best judgement- if baby has been sick a few times, it might be smart to cozy up at home for a bit, rest, and stay healthy! If there is ever any time to get a flu shot, it’s when there’s a baby in the house. Baby herself has to wait until 6 months for a flu shot, but the adults around baby can get one to avoid passing it on. Also, wash your hands. A lot. You’ve heard it a million times before, but theres a reason for that. It’s important. For more info, including signs and symptoms of the flu or pneumonia in newborns see this article. Rest- for everyone! Allow yourself to take a few days off of your normal routine and just care for baby and relax.